Plastering All Over The Manchester Area! Are you keen to renovate your home or office in Manchester and are on the lookout for high-quality yet affordable plasterers? Look no further than us. We are the leading plasterers in Manchester with a reputation of combining superior services with highly competitive rates. 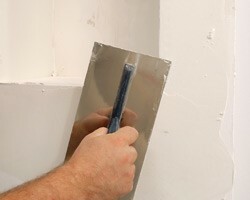 Whether you want to add more rooms in your home or office with plasterboard partition doors, or need to redecorate your home and make it more attractive with decorative plastering such as ceiling centres, cornices and covings, you can be confident that our highly experienced plasterers will offer an excellent decorative plastering and plasterboard partition plastering service. Wondering what type of rendering solution or decorative plastering will work well for your home or office? Need guidance on making the choice of the right rendering or decorative plastering type? Get in touch with us for a free consultation service on any domestic or commercial plastering service requirement that you may have. Call us today for free estimates on 0161 433 8260. And our prices are low!